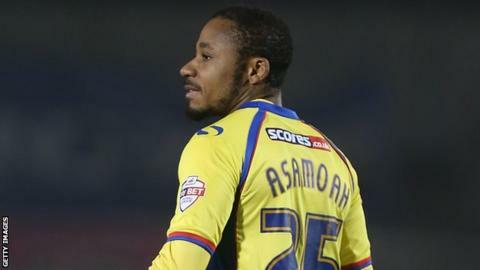 Carlisle striker Derek Asamoah scored twice as the Cumbrians beat Barnet in a five-goal thriller. Tom Miller headed the hosts into an early lead before Asamoah rounded the goalkeeper to double the advantage. Bira Dembele nodded home for Barnet and Michael Gash headed in a minute later to level things, as four goals were scored in the opening half hour. Asamoah slotted in Alex McQueen's cross midway through the second half to seal all three points for Keith Curle's men. "I don't think I've ever been involved in such a one-sided, dominant performance. "We were 2-0 down and should have been about six up, and that was in the first 10 minutes. "I'm sure if we keep our self-belief, keep practicing doing the right things and keep that high level of intensity that we've got in our game then the points will come our way." Match ends, Carlisle United 3, Barnet 2. Second Half ends, Carlisle United 3, Barnet 2. Mark Gillespie (Carlisle United) is shown the yellow card. Attempt missed. Curtis Weston (Barnet) right footed shot from outside the box is close, but misses to the left. Attempt blocked. Kevin Osei (Carlisle United) right footed shot from the centre of the box is blocked. Attempt missed. Sam Muggleton (Barnet) left footed shot from the right side of the box is close, but misses to the left. Attempt missed. John Akinde (Barnet) header from the centre of the box is close, but misses to the right. Attempt saved. Curtis Weston (Barnet) right footed shot from the centre of the box is saved in the centre of the goal. Attempt missed. Andy Yiadom (Barnet) right footed shot from a difficult angle on the left is close, but misses to the left. Corner, Barnet. Conceded by Tom Miller. Corner, Barnet. Conceded by Mark Gillespie. Attempt missed. Curtis Weston (Barnet) right footed shot from outside the box is high and wide to the left. Attempt saved. Luke Gambin (Barnet) left footed shot from the left side of the box is saved in the centre of the goal. Attempt saved. Aaron McLean (Barnet) right footed shot from outside the box is saved in the centre of the goal. Substitution, Carlisle United. Kevin Osei replaces Patrick Brough. Danny Grainger (Carlisle United) wins a free kick in the defensive half. Attempt saved. Bira Dembélé (Barnet) header from the centre of the box is saved in the top right corner. Corner, Barnet. Conceded by Patrick Brough. Attempt missed. Sam Togwell (Barnet) right footed shot from outside the box is close, but misses to the left. Substitution, Carlisle United. Gary Dicker replaces Bastien Héry. Substitution, Barnet. Ben Tomlinson replaces Mauro Vilhete. Substitution, Barnet. Aaron McLean replaces Michael Gash. Andy Yiadom (Barnet) wins a free kick in the attacking half. Attempt missed. Andy Yiadom (Barnet) right footed shot from outside the box is too high. Goal! Carlisle United 3, Barnet 2. Derek Asamoah (Carlisle United) right footed shot from very close range to the centre of the goal. Assisted by Alex McQueen with a cross following a fast break. Corner, Barnet. Conceded by Michael Raynes. Attempt blocked. Andy Yiadom (Barnet) right footed shot from the right side of the box is blocked. Corner, Barnet. Conceded by Luke Joyce. Substitution, Carlisle United. Alex McQueen replaces Joe Thompson. Attempt blocked. Luke Gambin (Barnet) left footed shot from outside the box is blocked. Mauro Vilhete (Barnet) wins a free kick in the defensive half. Danny Grainger (Carlisle United) wins a free kick in the attacking half.